In times of growing economic inequality, improving equity in education becomes more urgent. 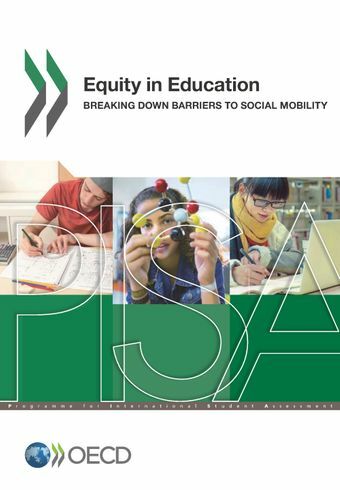 While some countries and economies that participate in the OECD Programme for International Student Assessment (PISA) have managed to build education systems where socio-economic status makes less of a difference to students’ learning and well-being, every country can do more.Equity in Education: Breaking Down Barriers to Social Mobility shows that high performance and more positive attitudes towards schooling among disadvantaged 15-year-old students are strong predictors of success in higher education and work later on. The report examines how equity in education has evolved over several cycles of the OECD Programme for International Student Assessment (PISA). It identifies the policies and practices that can help disadvantaged students succeed academically and feel more engaged at school.Using longitudinal data from five countries (Australia, Canada, Denmark, Switzerland, and the United States), the report also describes the links between a student’s performance near the end of compulsory education and upward social mobility – i.e. attaining a higher level of education or working in a higher-status job than one’s parents. How is equity in education changing? Are disadvantaged students affected by the socio-economic profile of their school?